An Ohio man is going to court today to deal with charges stemming from his decision to jump a fence at the Columbus Zoo, pet a few "geriatric" cougars, and film the whole thing while softly saying, "Here, kitty, kitty." “That was a very bad decision,” Josh Newell told a local news station earlier this week. Since the zoo animals were old and used to people, Newell emerged from the exhibit unscathed — at least until the zoo found out about it and pressed trespassing charges. He expects he’ll probably get fined today, and plans to beg forgiveness and offer to do some volunteering so he doesn’t get banned from the zoo. “They wanted me to pet them,” he told ABC News, also noting that it wasn’t his fault that jumping over the barrier was so easy — a defense he may want to finesse before heading to his arraignment. 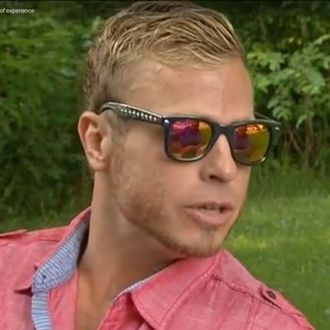 “Cougars love me,” the 35-year-old bartender told WBNS-10.